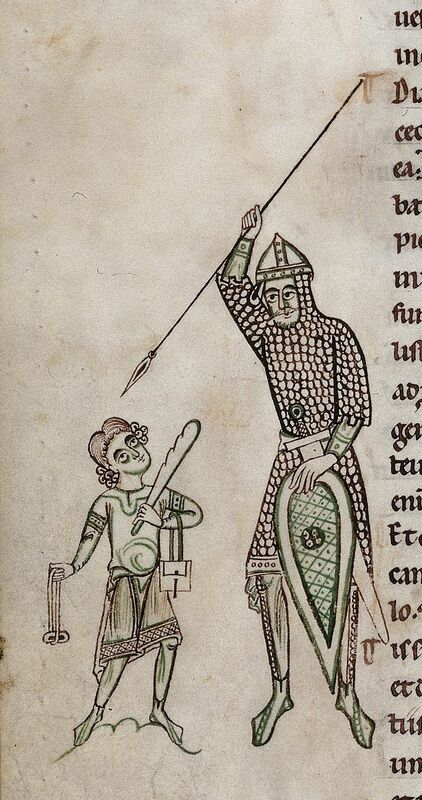 Description: Detail of a marginal drawing of David and Goliath. Referenced on p174, Arms and Armour of the Crusading Era, 1050-1350, Western Europe and the Crusader States by David Nicolle . In this manuscript Goliath is armed and armoured in a very basic style that indicates no particular regional or German variation. His helmet is a conical spangenhelm with a long curved nasal. This is worn over a mail coif that forms part of a long-sleeved mail hauberk. On his legs and feet are chausses which, though given a different pattern, are almost certainly of mail. His long kite-shaped shield has a guige, and his spear tacks wings or flanges but has a fringed gonfanon. His sword, shown somewhat schematically, has short broad quillons and a round pommel. It would be carried in a scabbard hung in traditional manner by split straps from a sword-belt.